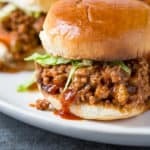 Classic Sloppy Joes recipe made in the Instant Pot. Ground beef and vegetables in a tangy-sweet tomato sauce. Serve on toasted hamburger buns. 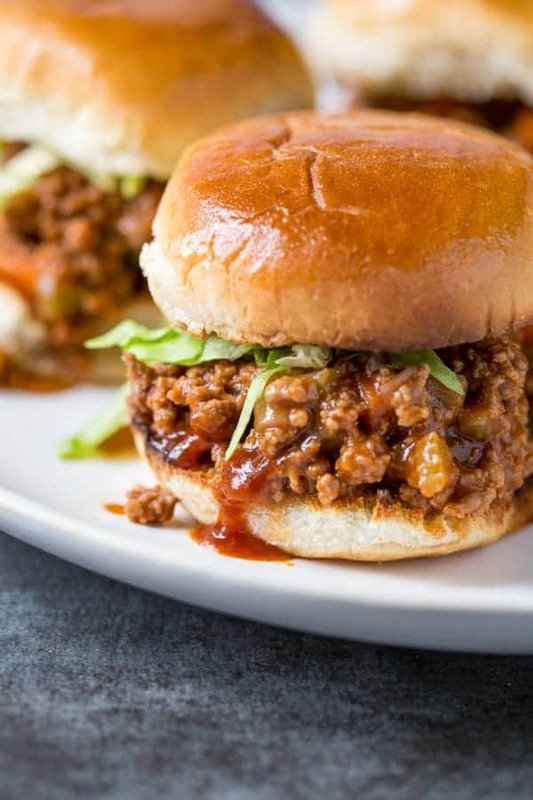 I wish I could tell you some lovely story about how when I was a kid my mom made Sloppy Joe’s and, blah blah blah, they were a cherished part of my childhood. This isn’t that story. 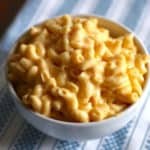 I grew up eating things like vegetarian chili and, of course, mac and cheese. I can’t even tell you a story about how I make my kids Sloppy Joe’s because…I don’t have kids. But I do have readers who request recipes. 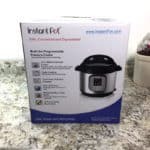 A few weeks ago, I got one that simply said, “How do I make Sloppy Joe’s in the Instant Pot?” Brevity. I love it. My answer: Um… let me get back to you on that. Turns out, I had a lot to learn about Sloppy Joes. 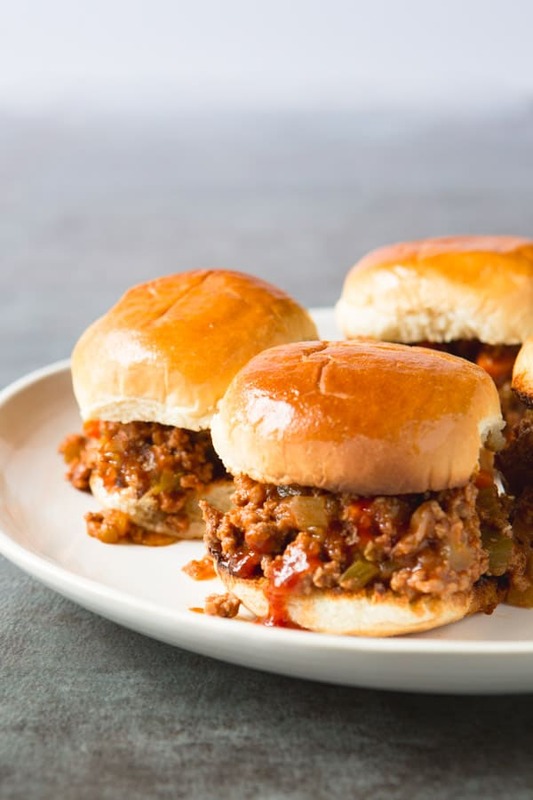 If you’ve eaten them, you already know that the traditional base for a Sloppy Joe is ground beef cooked in a sweet tomato sauce with some chopped vegetables thrown in for good measure. I say “traditional” because there’s countless variations on Sloppy Joes. Some use ground turkey. Some are vegan. Basically there’s a sloppy joe for everyone. One thread holds most of the recipes together: they start with a Sloppy Joe base, either a can of sauce or one of those dry packets of seasoning. If you want to use those ingredients, there’s really no need to make Sloppy Joes in the Instant Pot. Just follow the directions on the can or packet. But I’d argue that you sacrifice a flavorful sauce for the sake of convenience. Thanks to the Instant Pot, you can have both. You get a deeply flavorful sauce in about 20 minutes, instead of simmering for an hour. First, sauté the vegetables in the Instant Pot until they just soften. It might look like too many vegetables for Sloppy Joes at first. I promise it isn’t. To make quick work of this step, cut your vegetables the night before you plan on making Sloppy Joes. I swear, 99% of the work for this recipe comes from chopping!. Once the vegetables are a little soft, add the ground beef. To make your life easier, use an extra lean ground beef–about 93% lean works great. If the ground beef contains too much fat, you’ll need to skim the fat. This isn’t impossible but straining fat an Instant Pot is a bit of a pain in the you-know-what. Cook the ground beef until no large pieces remain. To do this, break up the ground beef with a wooden spoon, or one of those nifty meat breaker-up thingys. Cook the meat until it’s no longer pink. Usually this is a food safety issue. Not this time. When the meat goes under pressure, it will cook to the right temperature. (At least in this recipe. Always use good food safety practices.) The reason you want to cook the meat until it’s no longer pink is because if it’s still pink and not broken up enough, the chunks of ground beef in your Sloppy Joes will be too large. Now it’s time for the sauce. Some recipes use all ketchup. Others only canned tomatoes. I found I liked something in the middle. I use about half ketchup and half tomato sauce. (Not spaghetti sauce. You want to use a canned tomato sauce for this recipe. Regular spaghetti sauce has too strong of a flavor.) Then I add a little brown sugar, vinegar, and some chili powder. That’s it. This combination makes for a sweet sauce that’s not too sweet. It’s kind of like barbecue sauce without the smoke. Then cover the pot and bring to pressure. After the cook time completes, allow the pot to cool for five minutes before releasing pressure. Spoon onto buns–I like to toast mine before serving–and you’re done. Even though I’m new to Sloppy Joes, I see a lot of potential here. I’m going to play with different versions of this, some with more vegetables, maybe one with beans. I’ll keep you posted! Select the sauté setting and adjust it to high (more). When it shimmers, add the onion, celery, bell pepper, and garlic. Cook, stirring occasionally, until the vegetables start to soften, about 3 minutes. Add the beef and cook, breaking up the meat into small pieces with a wooden spoon, until no longer pink, about 4 minutes. Add the tomato sauce, ketchup, water, Worcestershire sauce, vinegar, brown sugar, chili powder, salt and pepper. Stir to combine. Stir the Sloppy Joe mixture. You can serve as is or you can thicken the sauce. To thicken, stir together the cornstarch and warm water in a small bowl until smooth. Add the cornstarch mixture to the beef mixture. Set the pot to “sauté” (You might have to turn off your pressure cooker and turn it back on to do this.) Cook, stirring occasionally, until the mixture bubbles and thickens, about 2 minutes. Taste. Season with salt and pepper as needed. Spoon Sloppy Joe mixture on the bottom halves of the buns. Cover with the bun tops and serve immediately. 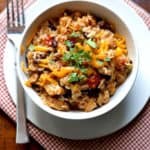 Made this several times with ground turkey.. so delicious every time with or without buns! Thanks! !